​Throughout most of human history, babies have thrived on only one food: breast milk. Across the world, human milk is recognized as the optimal form of infant nutrition because of its nutritional quality, the health benefits it provides, and its innate place in our life’s framework. The Breastfeeding Coalition of Delaware strives to protect, promote, and support breastfeeding in Delaware by imparting current and evidence-based information and skills to enable parents, families, health practitioners, and community leaders to make informed decisions. Please view our Strategic Plan, Diversity Values Statement & Guiding Principles and feel free to contact us with any questions, comments, or suggestions. We welcome you to join in these exciting efforts! 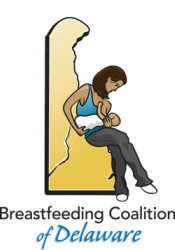 To address disparities in breastfeeding, the Breastfeeding Coalition of Delaware aims to increase racial, ethnic and language diversity among peer and professional breastfeeding supporters living and/or working in Delaware. Congratulations to 2019 scholarship recipients: Kamalah Griffith and Ruth Yeboah!